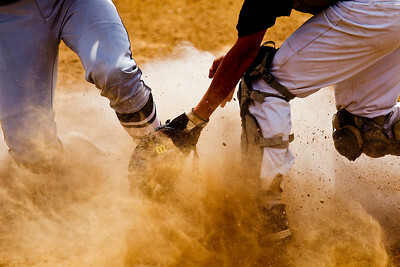 Kyle Grillot - kgrillot@shawmedia.com Jacobs' Grant Kale dives for a ground ball hit by Prairie Ridge's Christopher Slack during the second inning of the class 4A McHenry sectional final Saturday in McHenry. Prairie Ridge beat Jacobs, 4-1. Kyle Grillot - kgrillot@shawmedia.com Prairie Ridge's Getzlman slides safely home under the defense of Jacobs Jeff Sidor during the second inning of the class 4A McHenry sectional final Saturday in McHenry. Prairie Ridge beat Jacobs, 4-1. 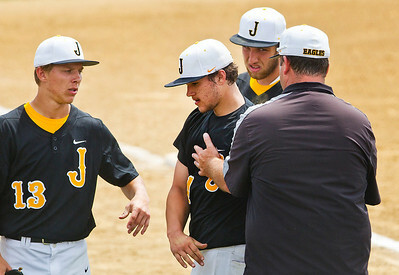 Kyle Grillot - kgrillot@shawmedia.com Jacobs' Matt Kozlak (from left), approaches pitcher Brenden Heiss after the second inning with Ben Murray and head coach Jamie Murray during the class 4A McHenry sectional final Saturday in McHenry. Prairie Ridge beat Jacobs, 4-1. 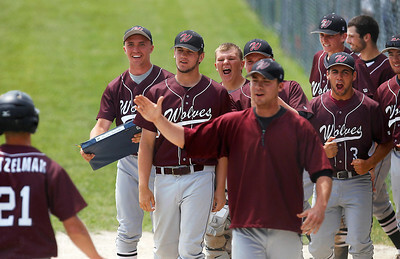 Kyle Grillot - kgrillot@shawmedia.com The Prairie Ridge team celbrates as Carson Getzlman returns to the dug out after a scored run during the second inning of the class 4A McHenry sectional final Saturday in McHenry. Prairie Ridge beat Jacobs, 4-1. 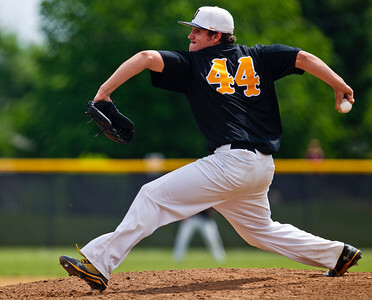 Kyle Grillot - kgrillot@shawmedia.com Jacobs' Brenden Heiss pitches against Prairie Ridge during the second inning of the class 4A McHenry sectional final Saturday in McHenry. 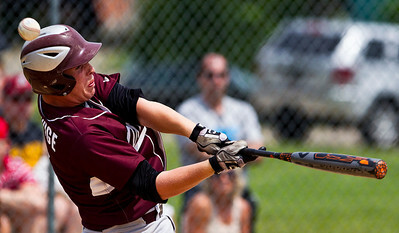 Prairie Ridge beat Jacobs, 4-1. 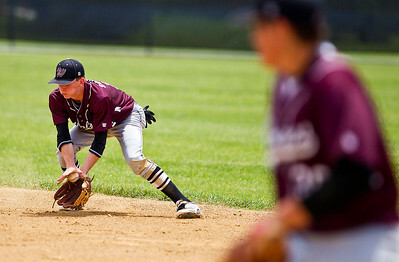 Kyle Grillot - kgrillot@shawmedia.com Prairie Ridge's Caleb Aldridge fields the ball during the sixth inning of the class 4A McHenry sectional final Saturday in McHenry. Prairie Ridge beat Jacobs, 4-1. 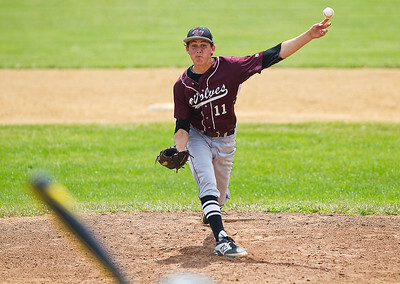 Kyle Grillot - kgrillot@shawmedia.com Prairie Ridge's Austin Covers pitches against Jacobs during the second inning of the class 4A McHenry sectional final Saturday in McHenry. Prairie Ridge beat Jacobs, 4-1. 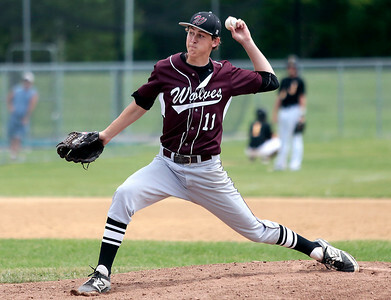 Kyle Grillot - kgrillot@shawmedia.com Prairie Ridge's Connor Schneider fields the ball during the sixth inning of the class 4A McHenry sectional final Saturday in McHenry. Prairie Ridge beat Jacobs, 4-1. 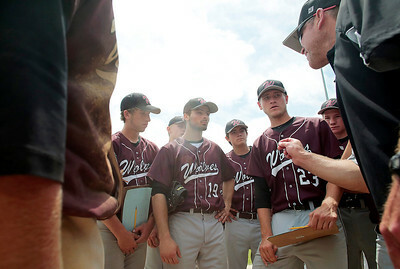 Kyle Grillot - kgrillot@shawmedia.com The Prairie Ridge team listens to coach Glen Pecoraro after the second inning of the class 4A McHenry sectional final Saturday in McHenry. Prairie Ridge beat Jacobs, 4-1. 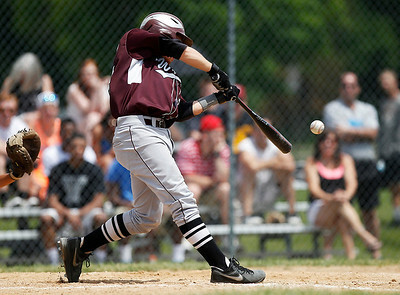 Kyle Grillot - kgrillot@shawmedia.com Prairie Ridge's Dustin Thelander hits a ball during the fourth inning of the class 4A McHenry sectional final Saturday in McHenry. Prairie Ridge beat Jacobs, 4-1. 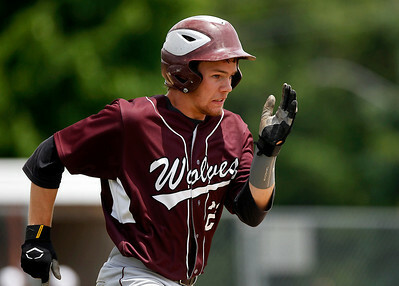 Kyle Grillot - kgrillot@shawmedia.com Prairie Ridge's Dustin Thelander runs towards first base after hitting the ball in the fourth inning of the class 4A McHenry sectional final Saturday in McHenry. Prairie Ridge beat Jacobs, 4-1. 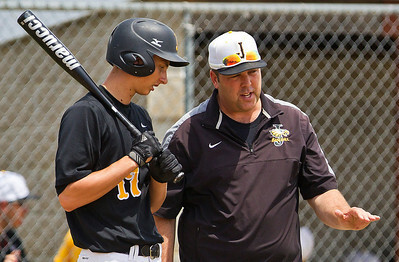 Kyle Grillot - kgrillot@shawmedia.com Jacobs' Tim Hubner talks with head coach Jamie Murray before batting during the fourth inning of the class 4A McHenry sectional final Saturday in McHenry. Prairie Ridge beat Jacobs, 4-1. 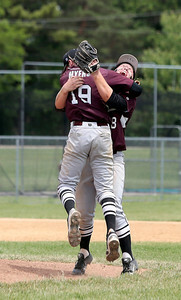 Kyle Grillot - kgrillot@shawmedia.com Jacobs' Grant Kale celebrates with Ben Murray after making a diving catch for for a fly ball during the sixth inning of the class 4A McHenry sectional final Saturday in McHenry. Prairie Ridge beat Jacobs, 4-1. 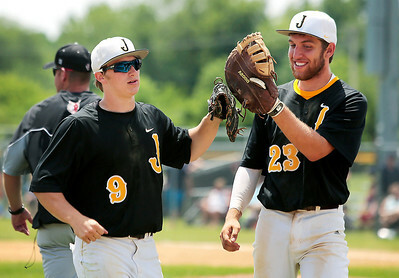 Kyle Grillot - kgrillot@shawmedia.com Jacobs' Grant Kale reacts after diving for for a fly ball during the sixth inning of the class 4A McHenry sectional final Saturday in McHenry. Prairie Ridge beat Jacobs, 4-1. 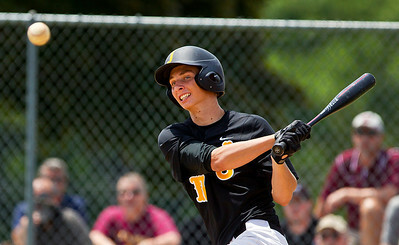 Kyle Grillot - kgrillot@shawmedia.com Jacobs' Tim Hubner hits a foul ball during the sixth inning of the class 4A McHenry sectional final Saturday in McHenry. Prairie Ridge beat Jacobs, 4-1. 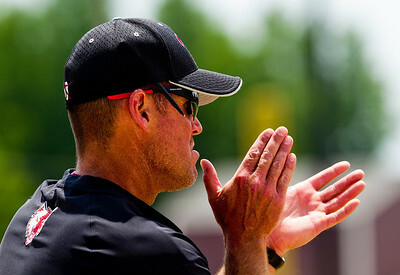 Kyle Grillot - kgrillot@shawmedia.com Glen Pecoraro cheers on his team from thrid base during the seventh inning of the class 4A McHenry sectional final Saturday in McHenry. Prairie Ridge beat Jacobs, 4-1. 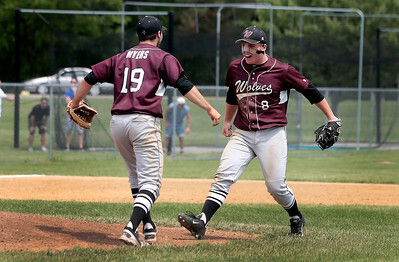 Kyle Grillot - kgrillot@shawmedia.com Prairie Ridge's John Myers and Caleb Aldridge celebrate after the final out of the 7th inning of the class 4A McHenry sectional final Saturday in McHenry. Prairie Ridge beat Jacobs, 4-1. 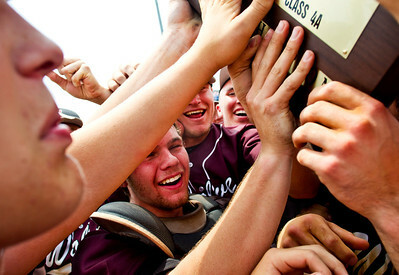 Kyle Grillot - kgrillot@shawmedia.com Prairie Ridge's John Myers celebrates with his team after beating Jacobs in the class 4A McHenry sectional final Saturday in McHenry. Prairie Ridge beat Jacobs, 4-1. 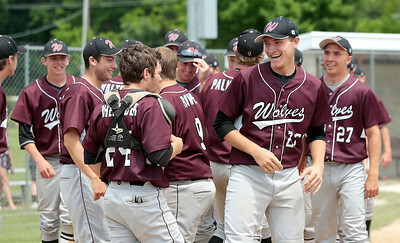 Kyle Grillot - kgrillot@shawmedia.com The Prairie Ridge team, including Timothy Jablonsky (right), celebrates after beating Jacobs in the class 4A McHenry sectional final Saturday in McHenry. Prairie Ridge beat Jacobs, 4-1. 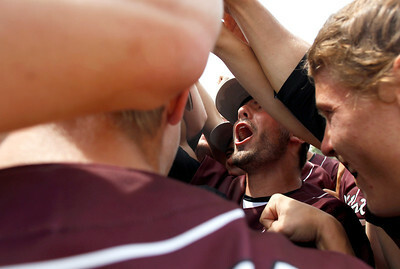 Kyle Grillot - kgrillot@shawmedia.com Prairie Ridge's Dustin Thelander celebrates with his team after beating Jacobs in the class 4A McHenry sectional final Saturday in McHenry. Prairie Ridge beat Jacobs, 4-1. 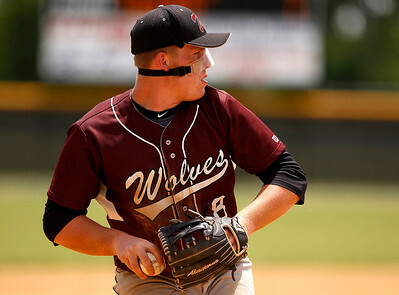 Prairie Ridge's Austin Covers pitches against Jacobs during the second inning of the class 4A McHenry sectional final Saturday in McHenry. Prairie Ridge beat Jacobs, 4-1.